The 8th Annual Carolina Games Summit will feature an official Ghost Recon: Future Soldier 4v4 tournament hosted by Red Storm Entertainment on Feb 2nd 2013. To promote this exciting addition to the event a free autographed copy of the game will be given away via re-tweet contest @cgsummit. ?Over the past seven years Red Storm Entertainment has exhibited, contributed prizes, keynoted, and hosted game development sessions at our event. We are extremely excited to add hosting an official tournament on their latest entry to the Tom Clancy franchise to that impressive list,? states Michael Everett, Creative Director for the Carolina Games Summit. Tom Clancy's Ghost Recon: Future Soldier is a third-person video game published by Ubisoft and jointly developed by Ubisoft Paris, Red Storm Entertainment, and Ubisoft Bucharest. Future Soldier is the fifth installment in the Ghost Recon series and was released for the PlayStation 3, Xbox 360, and PC. The campaign has settings such as Nigeria, Pakistan, Russia and Norway. Future Soldier features a fully cooperative campaign, as well as competitive multiplayer which will be the focus of the tournament. ?Red Storm is looking forward to the strategic and competitive rivalries that attendees of the Carolina Game Summit bring to the battlefields of Ghost Recon Future Soldier,? said Geoff Brock, Community Developer for Red Storm Entertainment. 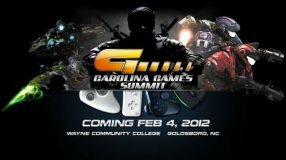 Prospective e-Sport competitors should gather three friends and register online now at www.CarolinaGamesSummit.com for just $10 per player, this price also includes full access to all the speakers, exhibitors, and excitement Carolina Games Summit has to offer. Ubisoft is a leading producer, publisher and distributor of interactive entertainment products worldwide and has grown considerably through a strong and diversified line-up of products and partnerships. Ubisoft has offices in 26 countries and has sales in more than 55 countries around the globe. It is committed to delivering high-quality, cutting-edge video game titles to consumers. For the 2011-12 fiscal year Ubisoft generated sales of ?1.039 billion. To learn more, please visit: www.ubisoftgroup.com. Tom Clancy?s, Ghost Recon, Ghost Recon Future Soldier, the Soldier Icon, Ubisoft, and the Ubisoft logo are trademarks of Ubisoft Entertainment in the US and/or other countries. cgs has 0 comment s on this chronicle.